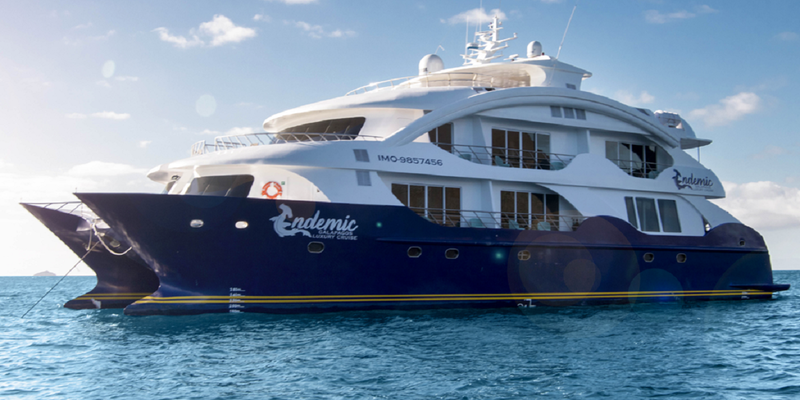 Navigating as of July 8th 2018, the Galapagos Endemic is the newest and most luxurious cruise yacht in the Galapagos archipelago. 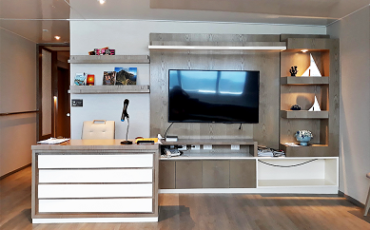 Guests will make themselves at home in one of our eight luxury panoramic suites, all of which feature either one king-sized bed or two twin beds. Each room comes with its own spacious natural light bathroom, writing desk, night stand and closet. 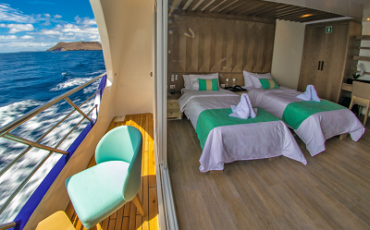 In addition, each suite boasts an outdoor balcony for enjoying a warm island breeze! 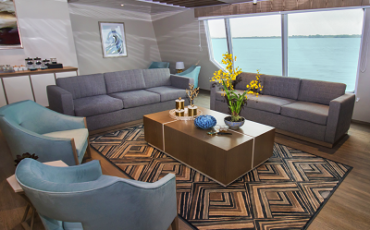 After a long day snorkeling and visiting the islands, guests will be able to relax in the spacious interior lounge with a cold drink. 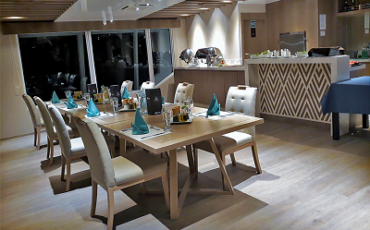 Irresistible meals created fresh from locally grown ingredients by the professional chef will be served in the al fresco dining area. 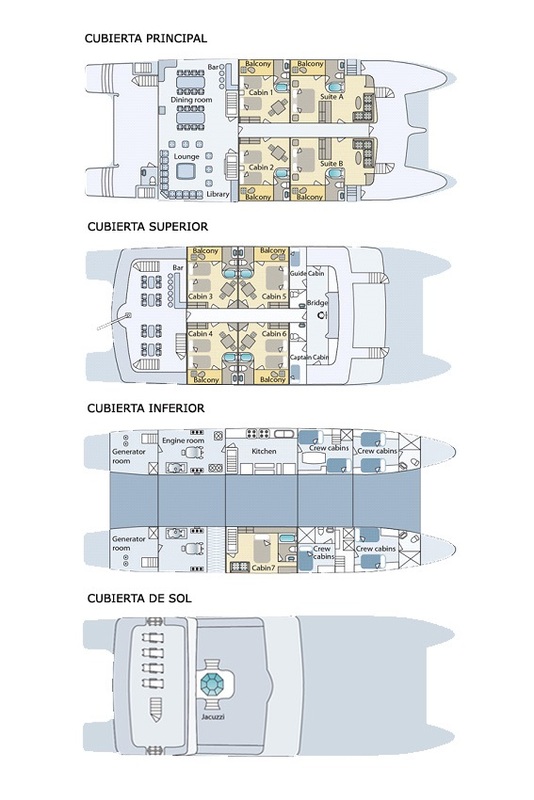 The Endemic, like almost all of the newest small Galapagos yacht cruisers, will have two hulls instead of one. 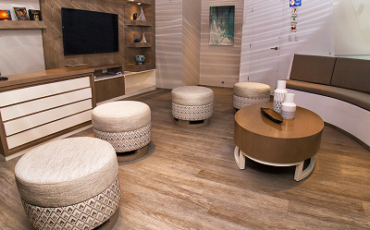 This design allows for much more space than traditional single-hulled vessels, meaning more room in suites and luxurious, comfortable common areas. What are you waiting for? 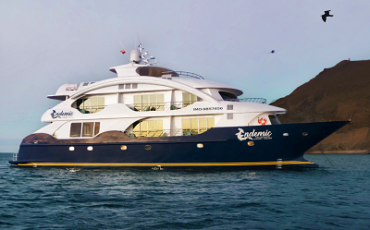 The Galapagos Endemic is waiting to take you on the trip of a lifetime! PM: Visit to Dragon Hill (Santa Cruz), located in the north-western part of Santa Cruz island where you will have the opportunity to walk into the island and view the land iguana. You will also be able to see a flamingos’ lagoon, pintail ducks and other endemic birds including flycatchers and warblers. After a short trek, amazing view awaits you up the hill. Offshore snorkeling before returning to the yacht. AM: The first spot to be visited is Kicker Rock, an impressive geological formation and nesting place of sea birds. Additionally, curious sea lions, and marine life can be found, such as fish, turtles, sharks, rays, representing the main attraction for snorkeling. 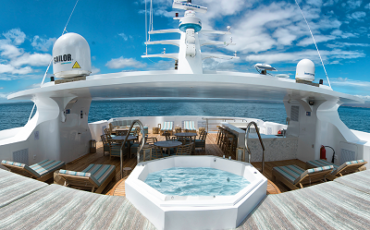 A zodiac ride will take you into amazing rock formations along the island shore. A white sand beach and crystal – clear waters are part of this enchanted location. Fantastic opportunity for snorkeling. PM: In the afternoon, you will be taken to Lobos Island, where a small population of blue – footed boobies, frigates, marine iguanas, and great frigate birds nesting can be observed. Snorkeling with sea lions in this calm bay is also part of the excursion. AM: Visit to Gardner Bay, a pristine white sandy beach, that is home to colonies of sea lions and inquisitive mockingbirds. It is also one of the world’s most important breeding sites for the waved albatross. A short dinghy ride will take you to the Osborn and Gardner Islets, which are superb locations for snorkeling with young sea lions and a greater variety of tropical fish and corals. PM: Suarez Point is an area with an outstanding variety of wildlife. The walking trail will take you past nesting sites of Nazca and blue-footed boobies, whilst Galapagos doves, mockingbirds and finches can be seen foraging nearby. You will also pass a geyser which can spray water up to 25m into the air; a spectacular feat of nature. Finally, when you reach the top of the breathtaking cliffs, you can enjoy watching waved albatrosses launching themselves out across the ocean. 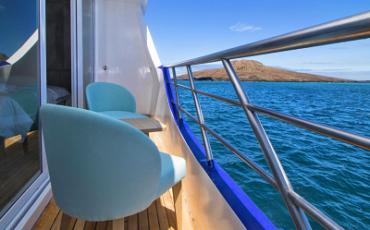 AM: Visit to Santa Fe island, which was formed as a result of a volcanic uplift and is inhabited by the endemic yellow-green Santa Fe iguana, Galapagos snake and rice rat. There are two main trails on the island, one that leads to a beach through a forest of tall Opuntia (prickly pear) trees; another that takes you into the highlands and culminates in a stunning cliff top viewpoint where Galapagos hawks can be sighted. It is also possible to snorkel along the shoreline with the highly entertaining sea lions. PM: One of two small islets, South Plaza island houses a rich diversity of wildlife and vegetation. 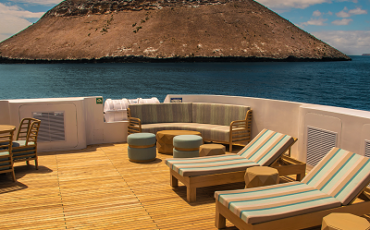 After passing a large colony of sea lions and ascending the slopes, you may catch a glimpse of swallow-tailed gulls, Nazca boobies, red-billed tropic birds, frigates or the rare lava gull. The ground is carpeted in Sesuvium, which transforms from bright red in the dry season to a vibrant green in the wet season, and land iguanas crowd around towering prickly pear cacti, waiting patiently for their juicy fruits to fall. AM: The Darwin research center carries out important scientific research into the preservation of the archipelago’s ecosystems and initiating a significant breeding programme in 1970 for giant tortoises. As well as accessing a wealth of information about the flora and fauna found across the islands, you will have the chance to see tortoises at all stages of their development. Having been reared in captivity, they are very accustomed to humans, so don’t miss out on getting a photo with one of these remarkable animals. PM: Transfer to the airport for your national flight back to the continent.